A contract for deed is one way that a buyer may finance a home. With this method, the seller provides financing to the buyer. Once the buyer pays off the purchase price, they are then provided with the deed. This method is often used when a buyer doesn't have the necessary credit to qualify for traditional financing. A contract for deed is also known as a land contract or a contract for sale. A contract for deed, also called a land contract or contract for sale, is a financing option for buyers who do not qualify for a mortgage loan to purchase property. In a contract for deed, the seller finances the purchase of the property much like a mortgage company would in a more traditional situation. The seller provides financing for the real property for the buyer. The seller holds the legal title and the buyer receives an equitable title. When the buyer pays the total agreed sale price, they receive the deed to the property from the seller. Both agreements offer the possibility of home ownership and the potential to earn equity in your property. Each also offers similar tax benefits and deductions. The primary difference between a contract and a mortgage is that that the buyer does not receive the property deed or title until they pay off the entire balance. Depending on state law, the seller may have the ability to have contract terms that allow them to foreclose if the buyer defaults and does not make their installment payments (often referred to as monthly payments). Renters do not own where they live. This means that they avoid home repair costs and can choose to move when their rental agreement ends. However, renters do not gain equity in their home; homeowners do. Renters, however, avoid the risk of an underwater mortgage in the event of a housing collapse, like what happened in 2008. 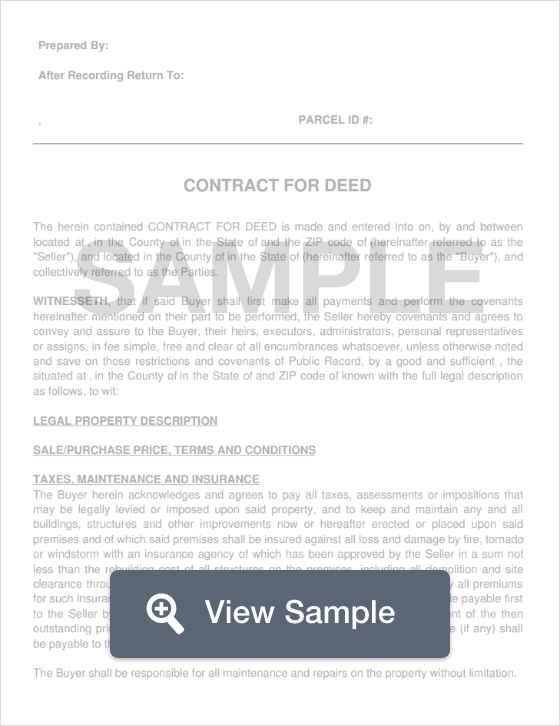 Create a free Contract for Deed in minutes with our professional document builder. A contract for deed is a contract for land. In general, these are very risky financial agreements, especially when you compare it to a conventional mortgage. Homeowners and home buyers may benefit from using a contract for deed, but that depends on several factors. Contract for deed sales can be a good option for those who wish to buy a home but cannot obtain a mortgage because of a credit score or other issue. This guide will teach you everything you need to know about these purchase agreements--what they are, what’s included, their pros and cons, how they differ from traditional agreements, how they work for farmers, etc. With this information, you can better assess whether they can meet your needs. Because buyers in contract for deed agreements often cannot obtain a mortgage, wrap around contract for deeds are common. In a wrap around arrangement, the seller already has and keeps a mortgage on the property. The buyer makes payments to the seller, who then uses the money to pay the mortgage and pockets any difference. Sellers may also earn additional income through overrides. In an override, the interest on the wrap around exceeds the vendor’s mortgage interest. The seller earns the difference in interest. What’s Included in a Contract for Deed? Earns regular income at a better interest amount than in other investments, like deposit certificates. Eliminates monthly expenses of owning the property. The income can help pay down other debt. Fast closing time and may have lower closing costs. Attractive way to sell a property that is non-conforming or has a code violation so it cannot be sold on the standard real estate market. Can minimize the costs of trying to find the perfect buyer in the standard real estate market. Can distinguish the property from others, which might help it sell more quickly. Do not have to qualify for financing, as with a traditional mortgage from a bank, lender, or credit union. A seller may, however, request a credit report. Flexible terms: you can negotiate a low down payment, the length of the contract, interest, payment frequency, etc. Faster and less expensive closing process. Requiring a copy of the buyer's credit report. Be sure to check for red flags including bankruptcy, evidence of late payments, foreclosure sales, or evictions. Purchase a title insurance policy. This entails a search of public records which will reveal any judgments, liens, etc. that have been issued against the buyer. Require a large earnest money deposit. The larger the deposit, the less likely the buyer is to walk away (and forfeit the money). Verify that the buyer is employed and earning sufficient income. Check their references, especially former landlords and ask about their payment history. There are many ways to do this, including requiring a balloon payment every x number of years, even if you amortize payments for a longer period of time (ex. 30 years). Make the buyer purchase a homeowners insurance policy. Set-up payments through a disbursement account. With this in place, the buyer makes payments to the disbursement account. The disbursement company then deposits the money into your account. This protects your personal information. You can also have the seller pay property taxes through the disbursement company which will ensure the taxes are paid on time. 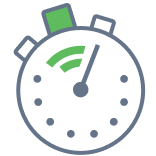 Include a late payment penalty in the contract for deed. This clause gives you the option of requiring the buyer to refinance if the property’s condition becomes a financial risk. Have them review the contract and ensure all clauses are legally binding. When does the buyer become the owner? As long as the buyer makes regular payments, they hold “equitable title” to the property. This means they have interest in the property. The seller cannot sell the property to a third party. When the buyer makes the final payment, they acquire the legal title to the property provided that all conditions of the contract are met. To transfer title, the deed must be filed with the appropriate government office (usually the county recorder) and name the new property owner. What if the buyer cannot make payments? If a buyer is unable to make their payments, the vendor can file a “land contract forfeiture” with a court. In this scenario, the buyer forfeits all the money paid towards the contract and loses their equitable title. As a Seller, How Do I Find a Buyer? If you want to explore selling your property using a contract for deed, here’s how to get started. Add “financing available” on all advertising materials. Create an information sheet on seller financing to give to potential buyers who visit your property. This will help them decide if a contract for deed is the right option for them. If you are a buyer, you can always ask a seller if they are willing to discuss seller financing. Farmers commonly use both contracts for deed as well as mortgage loans to buy farmland. For a farmer just getting started, a contract for deed might be easier and cheaper than trying to qualify for a mortgage. Furthermore, down payments and interest may also be lower on farmland than on a mortgage loan. Plus, in a contract, you do not have to pay mortgage origination fees, application costs, and other fees charged by mortgage brokers or other third-party lenders. For sellers, selling farmland with a contract has potential tax advantages because the money from the land sale is spread out, as opposed to paid in a lump sum. A contract can also be a way to help a new farmer, maybe a family friend or relative, acquire farmland. They’re also generally simpler than a traditional sale as they do not require a realtor, mortgage approval, or formal appraisal. As with virtually all of the history of housing in America, the history of contracts for deeds is one riddled with racial inequality and discrimination. From the 1930s through the 1960s, black home buyers were not eligible for federal mortgage insurance. So, they were unable to qualify for a traditional home loan. This created a black market for unscrupulous real estate investors who would sell property to black families with a contract for deed amortized over 20-40 years. These contracts came with exorbitant interest, and often contained language for “land contract failure” if a single payment was late. Rather than provide a pathway to home ownership, this further impoverished black families. More recently, investigations into the effects of contracts for deed sales found they largely prey upon low-income communities. Families are often sold properties that are poorly maintained, not up to code, and come with high interest rates. Sellers in these arrangements often abuse eviction clauses leaving evicted families without all of the money they have put into the property. Contracts for deeds are becoming more common because, roughly a decade removed from the 2008 financial crisis, many people still cannot obtain a traditional home loan. Contracts for deeds are often not an attractive option for a buyer or seller. However, in certain scenarios they may be the best option for those looking to buy or sell a home. We hope this guide helps you navigate the contract for deed market in an informed manner that will help you avoid the minefield these contracts often entail. A Contract for Deed applies to when a land owner sells their land to another person and helps finance the transaction. A Warranty Deed applies to real estate ownership, clarifying who has ownership of the property and their associated right to sell. Quit claim deeds are for transfer of property interests in specified real estate; it is not clear transfer of ownership. A signed Promissory Note establishes the obligations for repayment of a loan between two parties. It is legally enforceable, albeit often an arrangement between personal contacts, such as friends or family. It specifies schedule of payments, amounts payable and enforcement details.